Skeleton consists of two heavy-walled, sparsely-trellised lattice chambers. The cephalis is small, perforated by large open pores, and partially submerged in the broad, tubular thorax. Cephalis bears short external spines and a prominent axial spine projects into the thoraxic cavity. Upper margin of thorax swells sharply, and irregularly disposed short spines project upward from its surface. Thoracic lattice pores of irregular shape and distribution become increasingly large in the mid-length region. On many specimens, the most distal rows of lattice pores are of reduced size above the straight terminal margin, which is commonly inverted and partially enclosed. 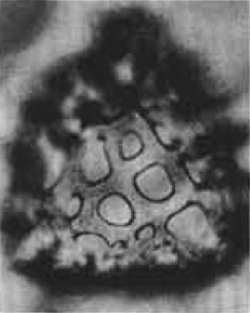 We have not been able to find in our sample from DSDP, 38-338-10-2, specimens similar to that illustrated by Petrushevskaya and Kozlova (1979). Diagnosis: A species of Ceratocyrtis characterized by broad smooth lattice bars and large irregular pores on the median portion of the thorax. The species is named posthumously in honor of Professor Waldemar C. Brrigger, 1851-1933, Royal Frederick's University, Oslo. Ceratocyrtis broeggeri occurs only in the C. broeggeri Zone of Samples 104-643A-15H-4, 25-27 cm to -14H-1, 109-111 cm; Samples 104-642B-22H-6, 75-77 cm; Sample 104-642C-24H-3, 25-27 cm; and Sample 104-642D-2X-6, 25-27 cm. 138-162 μm, maximum height of total lattice shell; 123-128 μm, maximum thoracic width. PMO 117.584; Sample 104-643A-15H-3, 107-109 cm; England Finder G54/2; PI. 5, Figs. 14-16.